How long have you been with Upside Motion? Kwan : For me, on weekends, we'd do separate exercises and I played other sports. I haven't been really working out on my core, flexibility and my balance. I was looking for something, and she really enjoyed the class and it was a good excuse for me to spend time with her. That's how I started. Then I started enjoying it myself, like I said, to help with the core, the balance and the flexibility. It complimented other sports that I do. What are the other sports that you do? Kwan : Golf, tennis, basketball- which I don't do anymore. Barre really helps with my golf moves--- my golf swings, and with basic fitness and everything. When it comes to golf, you have to have good balance and flexibility to turn the body and the waist, and also lower body stability. It has to be a good combination of all the moves in class. It really compliments it and I can feel the difference. Kwan : Not only that, I used to do a lot of weight training and heavy lifting but for here you use small weights to do different small moves to work your smaller muscles. I think that helps over-all: you work your shoulder muscles and your low back. It's a good exercise. Yuni : For me, I don't do other sports but I just feel more energized. 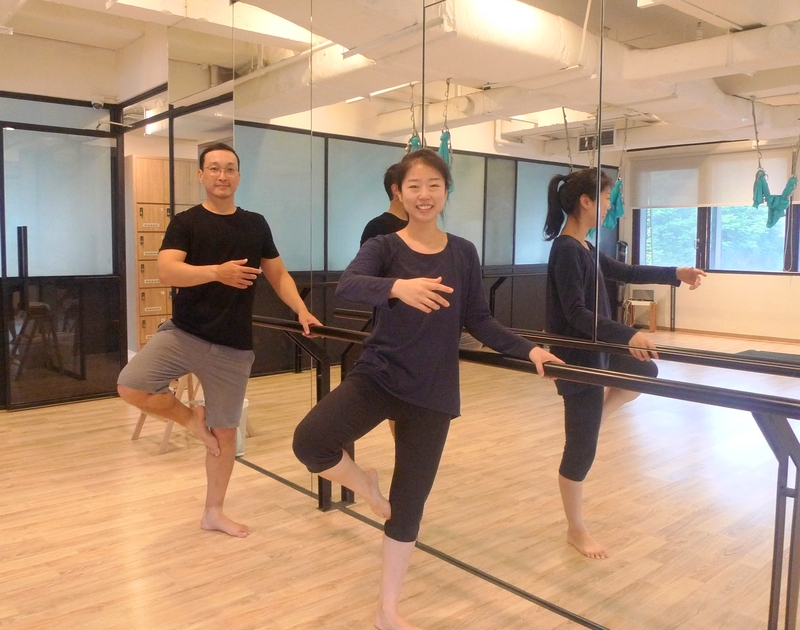 I was always tired during the weekend and when I do Xtend Barre, I feel that I can do more during the week. Kwan : I tried to make her do golf and tennis and other exercises but either it was too boring or too hot outdoors ---but this was a good combination of everything. I have never seen her so dedicated and do something so consistently, plus she also loves dancing. I know you guys only attend on weekend, what are you usually you up to during the weekdays? Kwan : On weekdays, it's tough. When we're at home we try to do a bit of stretching, but for weekdays we're usually out until 9 PM so we can't make it to the classes. Do you work mostly on the desk? Yuni & Kwan : Yes, it's a lot of desk work. Yuni : I used to have a lot of tightness in the shoulders but now I consciously sit upright or stretch a bit when I'm at work. Now, my shoulders have been okay. What advise will you give for guys who want to try Barre? Kwan : If you'll ask my honest opinion, in the beginning, I really did feel that Barre was a girly work-out. But 10 minutes into the work-out, when you're starting to sweat, you won't really care anymore. It's really getting over the first two or three lessons. When I started doing passés, it was so akward in the beginning, but now, I don't care, I just do it. In my twenties or early thirties, I would just go out and play some kind of active sport but I realized that my endurance was dropping and my joints were also not that good as before. At this age, I'm looking for something that is right for me, and over-all a good work-out. Actually I can see guys in their fifties, sixties doing this with the right level and right amount of understanding from instructors. Thanks guys! You have a really good understanding of the work-out and your weekend consistency really shows your progress. Barre does address cardio, strengthening and flexibility which are components of a balanced and sustainable work-out. It's really refreshing to hear your perspectives. Also, we really love that you come together, sharing what you love with someone you love!